Rosenthal RA, Zenilman ME, Katlic MR, eds. Principles and Practice of Geriatric Surgery. New York, NY: Springer; 2011. National Center for Veterans Analysis and Statistics. Veteran population. US Dept of Veterans Affairs website. http://www.va.gov/vetdata/Veteran_Population.asp. Accessed January 1, 2014. Half of the people older than 65 years of age will undergo a surgical procedure in their remaining lifetime.1 With more than 1 million veterans currently older than 84 years of age, many compromised individuals will be seeking surgical care in Veterans Affairs (VA) hospitals.2 Postoperatively, discharge needs are often underestimated and complicated to coordinate. In 2010, the Departments of Surgery and Geriatrics at the VA Connecticut Healthcare System received VA Clinical Initiative funding to create the Comprehensive Home-Based Acute Care Medical Program Initiative for Older Noncritical Surgical Patients (CHAMPIONS), an individualized program intended to return geriatric patients home with maximum independence after surgery. The CHAMPIONS team consisted of a geriatrician, an advanced practice registered nurse, a physical therapist, a surgeon, and a case manager. Geriatric patients undergoing elective major surgery were eligible. Patients gave oral informed consent to participate in CHAMPIONS. There was no financial compensation given. Preoperative cognitive assessments (using the Saint Louis University Mental Status Examination score), functional assessments (using the activities of daily living score and the independent activities of daily living score), and home safety assessments were conducted by the advanced practice registered nurse and physical therapist during home visits to determine in-hospital and postdischarge needs, including dementia prevention tools and home safety equipment. Patients were comanaged during hospitalization, seen at home 48 to 72 hours after hospital discharge, and followed up for 30 days. Emergency department visits and 30-day readmissions were tracked. Using match-paired Wilcoxon tests, we reassessed patients 30 days after hospital discharge for change in cognition or function. Institutional review board approval was obtained before analyzing the CHAMPIONS database. Seventy-two patients entered CHAMPIONS. Eight patients did not complete the program at the patient’s or patient’s family’s request, and only 6 required short-term rehabilitation; 58 patients were discharged home and completed the postdischarge evaluation. The median patient age was 79 years (range, 68-93 years). More than 87% of patients underwent general or cardiothoracic surgery (Table 1). Fifty-four percent had a cognitive deficit, and 35% were frail. There was no significant postoperative change in the Saint Louis University Mental Status Examination scores (for 55 patients; P = .92) or in activities of daily living scores (for 58 patients; P = .83). There was a small decrease in postoperative independent activities of daily living scores (for 58 patients; P = .03; maximum score, 16; preoperative median score, 16 [interquartile range, 14-16]; postoperative median score, 15 [interquartile range, 12-16]). Eighteen patients had emergency department visits within 30 days of hospital discharge, and only 8 of the 72 patients (11.1%) required readmission (Table 2). The use of CHAMPIONS has improved geriatric surgical care at the West Haven VA hospital as demonstrated by patients safely returning home without a clinically significant change in cognitive or functional status. The program has allowed very frail patients, who had been safe at home prior to surgery, to return home after surgery. As Zenilman3 proposed in 2013, CHAMPIONS uses geriatric indicators, such as frailty scoring, preoperatively to anticipate patients’ needs before and after surgery. 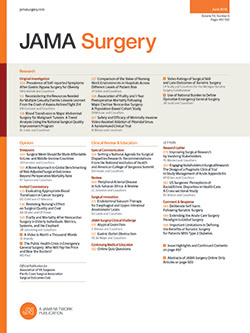 Indeed, many of the preoperative assessment parameters for CHAMPIONS are found in the “Checklist for the Optimal Preoperative Assessment of the Geriatric Surgical Patient” from the American College of Surgeons and American Geriatric Society.4 Tillou et al5 demonstrated that the use of geriatric consultation with trauma surgery patients improved outcomes. The positive outcomes of CHAMPIONS are credited to the comanagement of patients by the surgery and geriatrics teams. Beyond patient care, CHAMPIONS affords a care model within the VA healthcare system that can be used for education and research. During VA hospital rotations, Yale University surgery residents make rounds with the geriatric advanced practice registered nurse and get real-time feedback about how their care and medication choices may have different consequences for older patients than for younger adults; residents and students may join the advanced practice registered nurse and physical therapist on home visits to better understand patients’ needs. Lastly, as we have begun to demonstrate, CHAMPIONS, as a model of care, could be a rich source of outcomes data as we innovate health care delivery for geriatric patients. CHAMPIONS is a promising model of multidisciplinary care using preoperative in-home assessment, perioperative comanagement, and postoperative follow-up to return compromised older veterans safely to their homes with maximum function following major surgery. Corresponding Author: Ronnie A. Rosenthal, MD, MS, Departments of Surgery and Geriatric Medicine, Yale University School of Medicine, VA Connecticut Healthcare System, West Haven Campus, 950 Campbell Ave, West Haven, CT 06516 (ronnie.rosenthal@yale.edu). Published Online: September 24, 2014. doi:10.1001/jamasurg.2014.1335. Author Contributions: Drs Rosenthal and Tackett had full access to all of the data in the study and take responsibility for the integrity of the data and the accuracy of the data analysis. Study concept and design: Tackett, Walke, Accordino, Melin, Rosenthal. Drafting of the manuscript: Tackett, Melin, Rosenthal. Statistical analysis: Tackett, Accordino, Melin. Obtained funding: Walke, Accordino, Rosenthal. Administrative, technical, or material support: Accordino, Melin, Bishop, Rosenthal. Study supervision: Accordino, Kumar, Rosenthal.